Today, I visited the tiny town of Thallon in Queensland, about 600km from Brisbane. It’s a farming town that has done it tough over recent years due to drought, the closure of the railway and local services. I don’t expect you to have heard of Thallon. But in some respects, Thallon is ‘wombat central’ – or rather, it used to be. Back in the late 1800s, a local station manager named Mr Gillespie handed some wombat specimens to the Queensland Museum. He reported the local Indigenous people called these creatures, ‘Yaminon’. Sadly, since then, Northern Hairy-nosed Wombats disappeared from the region due to land clearing, habitat degradation and feed competition with introduced stock. Some might say the story ends there, but one determined member of The Wombat Foundation is supporting our work to bring the wombats back into their former range with a firm focus on reinvigorating the town of Thallon at the same time. Earlier today, I met Leanne Brosnan in town. 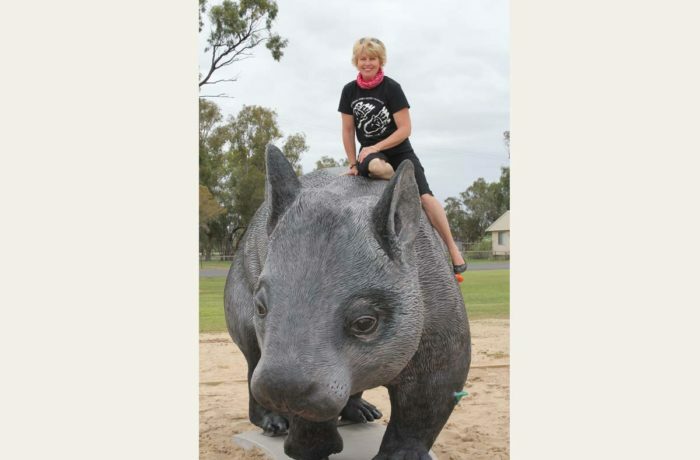 She’s the brainchild of 2.5m high and 3.5m William the Wombat. She hopes William’s arrival in Thallon will prove a drawcard for tourists and boost the local economy, all whilst supporting The Wombat Foundation’s search for additional sites for the Northern Hairy -nosed Wombat across their former range. It seems like Leanne has worked her magic. The entire town showed up to welcome William to his new home in the park across from the pub! Whilst William is of course, just a statue, it felt pretty special to welcome him home to Thallon. Some of you will know that back in 2009, 10 Northern Hairy-nosed Wombats were relocated from the single remaining population at Epping Forest National Park further north to Richard Underwood Nature Refuge in the Thallon/St George area to kick-start a new population. We’re excited to support conservation at the Refuge. I took the opportunity to visit yesterday: check out the video I took on our Facebook page. All in all, it’s been a fantastic couple of days and it’s great to know the town of Thallon is behind us as we search for additional sites to serve as protected areas for the Northern Hairy-nosed Wombat right across the species’ former range.